Climbing, American chocolate and some seriously bad skin. We have been in Joe’s Valley for just over 2 weeks now and the weather is starting to get cold…good conditions are on their way. However, some bad luck has forced our combined hand to change plans. Many of you who know David will know that he suffers from bad climbing-related thin skin on his fingertips and consequently split skin a great deal. This episode, however, tops anything in the past and he didn’t even do it climbing! 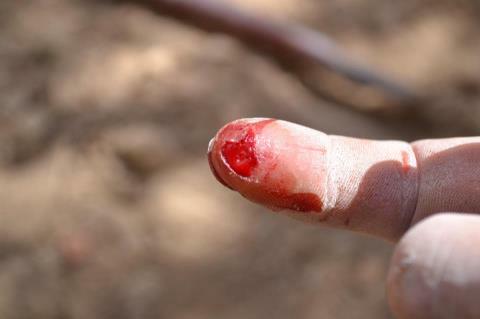 When abseiling to brush up a line his finger got caught between the rope and the rock and he somehow ripped off the pad of his finger tip. Eek. Pretty gory. Really annoying for him, especially as he was falling off the last move of Black Lung, one of his life-time climbing ambitions. So, with David realistically unable to climb for at least a week and then with tape for probably the next two, we have had to reconsider our options. Our original plan was to go to Yosemite (via Ibex) and then perhaps Bishop in December if we had time before heading home. The Bishop leg was for my benefit mostly, David was happy to go but more keen for Yosemite. I will admit that my desire to go to Bishop is partly because of one climb: The Mandala. I remember watching Dosage 1 as a teenager and seeing Chris Sharma climb this inspiring line in 2001. Ever since, I wanted to go to Bishop but it was only when Lisa Rands climbed the line that I thought (somewhere in the back of my mind) “hmmm…maybe one day I could do that”. So with David temporarily indisposed, it seemed a good idea to follow this dream now. Bishop sounds like a nice place to be if you’re not climbing and then when he is able to start again we can head to Yosemite. Mandala or no Mandala it will be great to visit this famous venue and a change of scene is what we need at the moment. Before we go I have a bit of unfinished business here. I have done lots of classics, a handful of V10s and a V11 (Ghost of War) and am very happy with my climbing. To date my most satisfying ascent is Beyond Life (V10); a wide, powerful climb which I found very hard! My favourite climbs have been Lumbar Jack (the V8 next to Beyond Life), Feels Like Grit (V8) and the climb that I am hoping to finish before we leave: Gentlemen’s Project (V11). Fingers crossed. One that I will be sad not to finish is Jitterbug Perfume (V10), a beautiful wall but definitely a test of pain tolerance. I have done all the moves but haven’t quite pieced it together. Maybe I’ll have one more go…maybe I won’t…. well, surely twix is next! it might be worth heading to moab for a few days. great rest day activities like arches and canyonlands national park, and great bouldering at big bend. possible the most skin friendly rock on earth. a beautiful place to spend a couple days. and hell belly is one of the most amazing compression climbs i’ve ever seen. like ‘tetris’, but even cooler. It was great to meet you and David! Joe’s Valley is incredible and I’m psyched to hear about all the problems you have sent! Good luck on Gentleman’s Project, if you haven’t crushed it already. Have fun in Bishop, hopefully we will see you somewhere in the future! Also…you need to try a Take 5. SO GOOD (even though I can’t eat them anymore since they have pretzels).